Enter the world of BERNINA embroidery. The multi-talent for sewing, embroidering and quilting. Whatever you wish to sew or embellish, the BERNINA 590 puts a wide range of stitches at your disposal. With a generous selection of stitches to choose – and all stitches can be sewn up to a width of 9 mm, which is particularly attractive for embellishment. In addition, 7 alphabets for sewing and 7 alphabets for embroidery are at your fingertips. What’s more, the embroidery designs can be accessed in a separate embroidery mode and adapted on the touchscreen: rotating, mirroring, sizing up or down or altering the stitch pattern are quickly accomplished, thanks to the 590’s intuitive operation. Using the memory function, it’s a cinch to permanently save your customized stitches and embroidery designs. The BERNINA 590 is factory-equipped with an embroidery function and comes with the embroidery module as standard. With embroidery designs already built into the BERNINA 590’s software, you’ll have immediate access to a wide range of attractive designs for ambitious embroidery projects, which you can easily and quickly select via the touchscreen. View BERNINA 590 product brochure. 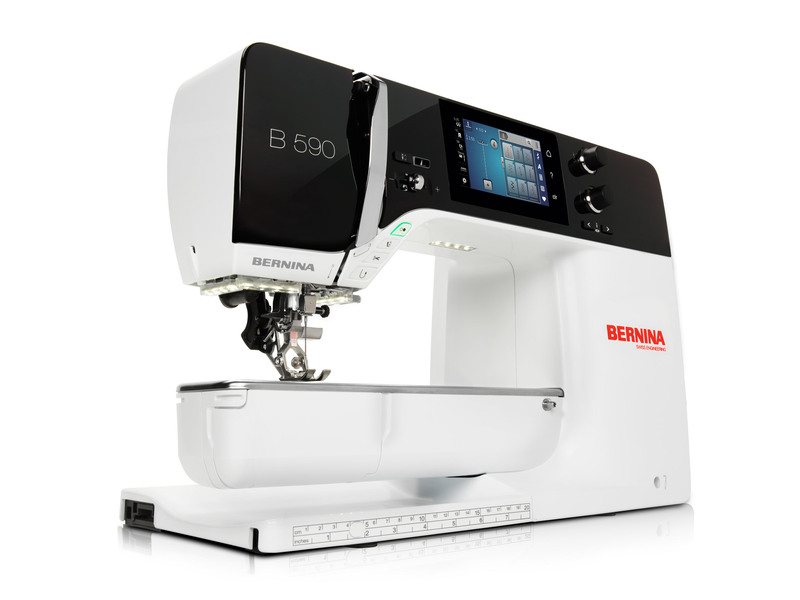 Experience the BERNINA 590 today!